Turkey experienced its bloodiest coup attempt ever on 15 July 2016, when 250 citizens were massacred and thousands more were injured by putschists. As the biggest victim of the 12 September 1980 coup, the Confederation of Progressive Trade Unions of Turkey (DİSK), we immediately condemned this coup attempt and demanded trials and punishment for the coup plotters. Prosecuting the coup plotters and dismantling the parallel structure inside the state is of vital importance for democracy and the rule of law in Turkey. While DİSK has condemned the coup attempt and defended democracy and the rule of law, it has also criticized the state of emergency, which has bypassed parliament in the name of the fight against the coup. From the very beginning, DİSK has opposed the state of emergency, arguing that the struggle against the Fethullahist Terror Organization/Parallel State Structure (FETÖ/PDY) and the coup plotters should be conducted in accordance with the rule of law and through the National Parliament. Unfortunately, over the course of the past year, the exact opposite of our demands has occurred. The government opted to take advantage of the state of emergency instead of using the National Assembly, which the putschists also attempted to silence. In sum, the state of emergency has exceeded its legal boundaries. In the 12 months of emergency rule, 26 statutory decrees were issued, while changes were made to a total of 107 laws. A majority of the changes imposed by the decrees have nothing to do with the reasons for the state of emergency. Still, the government has used statutory decrees to pass regulations on winter tires for automobiles, prohibit strikes and appoint deans to universities despite the lack of any connection with the coup. In addition, the state of emergency has turned into a tool to oppress all opposition. Some 169,013 people have been prosecuted, 50,510 people have been arrested, including 167 journalists, 85 mayors and 12 members of parliament. All of these developments constitute a black stain on the history of our democracy. In the past year, 112,530 people have been expelled from public duty, representing the biggest purge in the public sector in the history of the Turkish Republic. The current purge in the public sector is much bigger than the previous eras of military rule such as seen in the wake of the 1980 and 1961 coups. In contrast, following the devastating 12 September 1980 coup, just 5,000 people were expelled from the public sector. Five strikes, covering 24 thousand workers, have been banned during the state of emergency. Recently, President Recep Tayyip Erdoğan made a statement claiming that “strikes present a threat,” demonstrating that the state of emergency is having an enormous negative effect on labour rights as well. The state of emergency has already dismantled job security for public servants and public sector workers and further limited the exercise of trade union rights. There have been no attempts to prosecute those who permitted this parallel organization to occupy state institutions, including politicians, or those who cooperated with them. Instead, many public servants are being expelled from duty without committing any crime. Dozens of trustees have also been appointed to run municipalities in lieu of elected mayors. A majority of the municipalities affected were jurisdictions in which DİSK Genel- İş was organized. Some 506 members of DİSK Genel-İş have been expelled with the decrees, while 1,456 Genel-İş members were also dismissed by the trustees who were appointed in place of elected mayors. In total, 1,959 Genel-İş members have lost their jobs through decrees or because of trustees in the municipalities. Many people, including DİSK members, have been dismissed from their jobs because of their social media posts. At the same time, 5,597 academics have been expelled from university, 400 of whom signed a peace declaration calling for an end to fighting in Anatolia’s east and southeast. Those deprived of the right to work have also been deprived of any legal procedures to challenge such decisions. Administrative courts and even the Constitutional Court have declared that they cannot examine any cases against the decrees. Moreover the European Court of Human Rights has also refused to accept the applications, claiming that all domestic judicial avenues have yet to be exhausted. A “State of Emergency Practices Examination Commission” was theoretically established for this purpose, but since there are too many cases, the panel lacks enough resources to examine the cases. Even if the commission aimed to adjudicate all the cases within one year, it would need to spend no more than 65 seconds on every case. The statutory decrees have resulted in the closure of many foundations, universities, hospitals, associations, newspapers, journals and media distribution companies, as well as the transfer of their assets to government institutions. However, workers in these organizations have been denied their wages or severance payments in the wake of the closure of their employers. 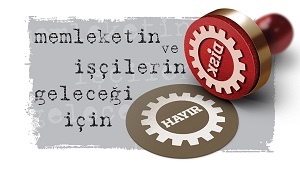 Some trade unions closed during state of emergency claiming that connected the FETÖ/PDY. According the legislation it is possible to suspend the activities of unions during the state of emergency, but closing such organizations is against the law. Any decision to close a union must be given by a court. Many workers’ demonstrations have been prohibited or obstructed using the state of emergency as an excuse. Press statements or rallies of DİSK and affiliated unions, such as Birleşik Metal-İş, Gıda-İş, Güvenlik-Sen, Limter-İş and Nakliyat-İş, have all been prohibited by authorities. Before declaring a state of emergency, the Justice and Development Party (AKP) government had banned eight strikes, but in the past year of emergency rule, it has also banned five more strikes, claiming that such labor action threatens national security, national health, or national financial stability. Among the prohibited strikes are two strikes by one of our affiliates, Birleşik Metal-İş. President Erdoğan has openly said in two different meetings with employers’ organizations that bans on strikes have been included within the repertoire of state of emergency practices. In conclusion, our report demonstrates that the state of emergency has become a tool to violate the most basic rights. At the beginning of emergency rule, the government said the “state of emergency had not been declared against the public,” but their impositions prove otherwise. The state of emergency violates the rights of workers. We would like to declare once more that we will struggle for the abolition of the state of emergency which provides capital with the resources to exploit workers to an extraordinary degree, results in massive levels of unemployment, increases precarity and violates rights.